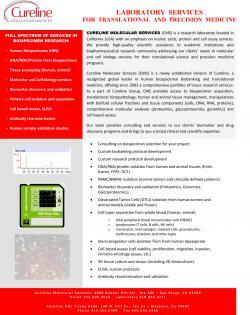 CURELINE MOLECULAR SERVICES (CMS) is a newly established CRO laboratory division of Cureline (www.cureline.com), a global leader in human biospecimen acquisition and analyses. CMS focus is Molecular and Cell Biology services for translational science and precision medicine programs, including manipulations with biofluid cellular fractions and tissue components (cells, DNA, RNA, proteins), comprehensive molecular analyses (proteomics, glycoproteomics, genomics) and cell-based assays. As a part of Cureline Group, CMS also provides access to biospecimen acquisition, translational histopathology, human and animal tissue management and proprietary glycoproteomic technology. BIOSPECIMEN MOLECULAR ANALYTES: DNA, RNA, Protein lysates – isolation and analyses. normal and tumor tissues, etc. We are looking forward to establishing a connection with your company R&amp;D team, discussing how Cureline Molecular Services could assist your translational research programs, and together accelerating the Patients access to novel medicines and diagnostic tests. Please contact us at CMSinfo@cureline.com for any further information.